There are many carport projects where budget is a big factor and Mr Carports can certainly help you find ways of building a Sydney carport while keeping costs to a minimum. But if budget is less of a concern and quality, style and wow factor are the key objectives, then a tiled roof carport is well worth considering. This is particularly the case when your home has a tiled roof. One of the keys in carport design is to create a carport that complements or perfectly matches the home it’s built near or next to. So, if you can accurately match the tiles on your home when choosing tiles for your Sydney carport (which is generally easy to do) you’ll be well on the way to creating the wow factor. What are other things you should consider if you want to create the wow factor? You’ve chosen a tiled roof carport, but what about the style of your home’s roof? Is it a standard gable, Dutch gable, hip or another style? Match the style and your carport will look fantastic. Similarly, try to match the materials featured in your home. For example, if your home has timber posts you’ll want to use timber posts on your Sydney carport. Colour is also important and generally easy to match. In addition, if your home has any design elements, such as infills or finials, you may want to incorporate these into your tiled roof carport. By matching the tiles, the roof style, the colours and any design elements of your home, you’ll be well on the way to creating a Sydney carport that will look like it was built at the same time as your home. Alternatively, if you prefer a carport that complements rather than perfectly matches your home, you can be a little more creative. So, for example, you might want to paint your carport grey to complement your predominantly white house. 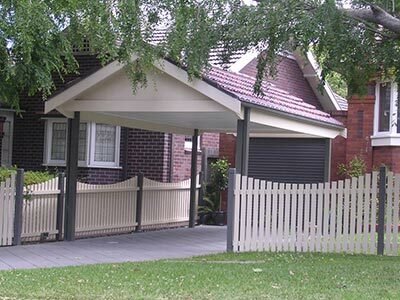 Or you may choose a rendered Sydney carport that matches your brick home. Of course, it’s not just the style, materials, design elements and colours you need to consider. There are also decisions such as where your Sydney carport will be located, whether it will adjoin the house or be freestanding, how big it will be and whether you need local government approval. Sounds like a big job? It is, but help is at hand. If you’re considering building a new Sydney carport give us a call on 1800 557 782 and we’ll organise a time to catch up to go over all of the key decisions. You can also look at our Sydney branch page for inspiration and ideas.